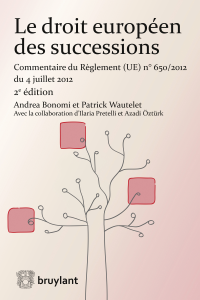 A second edition of the commentary of the Succession Regulation written by Andrea Bonomi and Patrick Wautelet has just been published. As with the first edition, the book is conceived as a commentary, article by article, of the Regulation. Written in French it provides in more than 1.000 pages a comprehensive analysis of the Regulation taking into account the vast literature already published on the Regulation, as well as various measures adopted by Member States in order to facilitate the practical operation of the Regulation.